The new resealable packaging arrived today. Each package is stamped with the logo for Merlin’s Magic, 5 lbs, and the color in waterproof ink. These are brown bags which are lined with a plastic interior, and easy to fold down top with fasteners. They hold up quite well to the rigors that I put it through to test it for travel by post. If you are used to the plastic bags, these take up a bit less space, hold their shape, and a bit sturdier. I actually put a bag into the old plastic bags to test to see if I could break the new bags and not wear five pounds of hobby stone. The results brown bag 1, plastic bag 0. The plastic bag did not survive but good for testing area and me, the brown bag held up quite well. Thank you all for your patience during the transition period. We are still working on things at the moment and it is coming along well, I’ll keep posting updates. There are still some delays in fulfillment as I’m waiting on supplies to get to me, it depends on what product you are needing at the moment. The first major news from the transition is that Excalibur is coming. I will have a listings open to the store once the first shipment arrives. Excalibur is another dental stone that can also be used in crafting molds. Excalibur is not as thin as Merlin’s Magic but has a compressive strength of 18,000 psi. Excalibur comes in White, Grey, Blue, Violet, and Green. We will be carrying all colors. I will be offering packaging in multiples of 5 from 5 to 50 lbs. 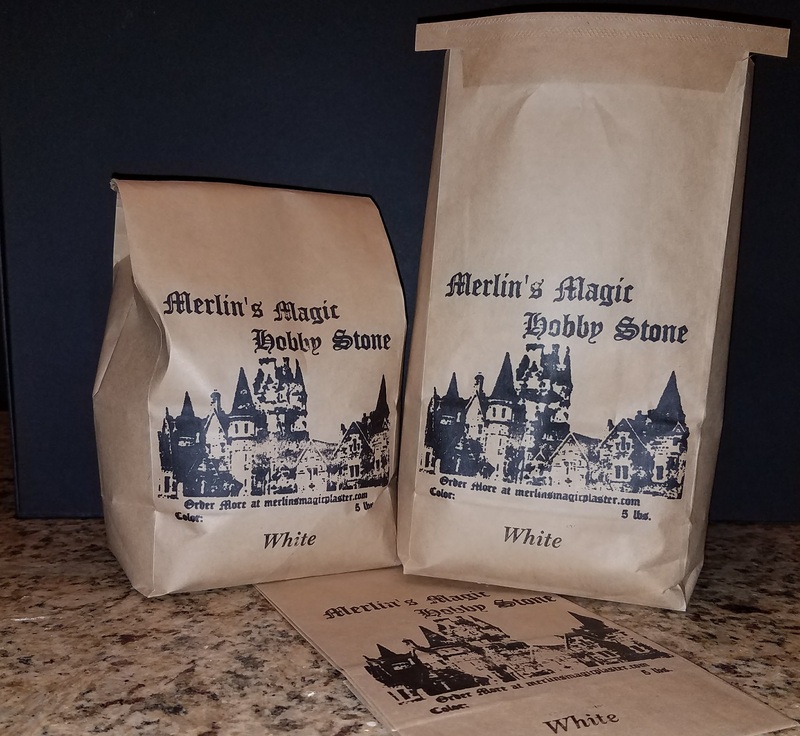 I am shifting over to a new resealable package for sending out both Merlin’s Magic and Excalibur. I will have pictures as soon as I’ve put together the first batch of them (again waiting on shipping). The look and resealing mechanism will resemble a five pound coffee bag. Once I receive the supplies, I will be updating the store with four new sizes. Pre-packaged 25 and 50 pounds will be available. These will be broken up into the normal 5 pound packages that will be resealable in the new packaging. These will be slightly more than the Drop Ship options but will come in easy to handle and use smaller packages so you do not have to fight with the big bags. The store will also have options for 40 and 45 pound options, also in multiple 5 pound packages. I’m looking to start a gallery to show case off the wonderful projects that you all create. If you wish to send in pictures, I’ll include a brief description and artist credit to showcase.